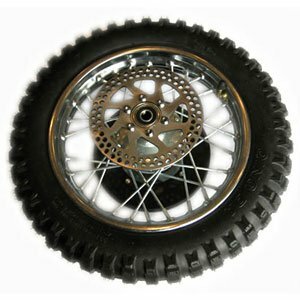 Replacement Rear Wheel Assembly for the Razor MX500 & MX650 Dirt Rocket. Includes rim, tire, innertube, brake rotor, chain sprocket/free wheel (fly wheel), axle and spacers. Compatible with all versions of the MX500 and MX650. The fly wheel is welded on to the wheel assembly and is, therefore, not available as a separate part.